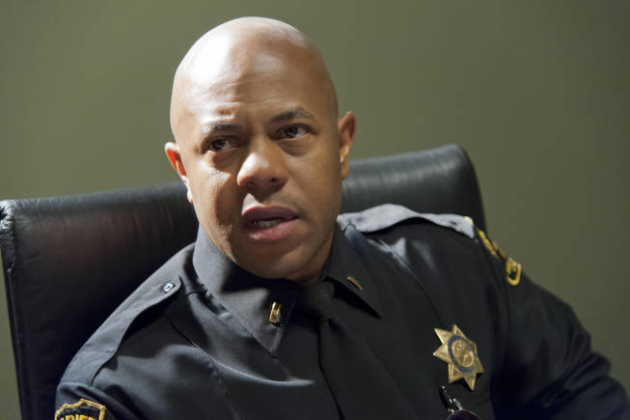 The part of Lieutenant Eli Roosevelt on the Sons of Anarchy is played by Rockmond Dunbar. Rockmond Dunbar (born January 11, 1973 in Berkeley, California) is an American actor. He is perhaps best known for his roles as Kenny Chadway on the Showtime television drama series Soul Food, and as Benjamin Miles “C-Note” Franklin on the FOX television drama series Prison Break. In 2007, Dunbar starred on the short-lived TNT medical drama Heartland. He made a guest appearance on Noah's Arc as himself to give Noah (screenwriter and the main character of the show) some ideas about his movie Fine Art. He also had a recurring role on the UPN series Girlfriends, and is also known for his role as “Pookie” on the television series The Game. He was also a regular on the short-lived FX series Terriers.Dunbar's other TV credits include guest appearances in Earth 2, Felicity, The Pretender, Two Guys and a Girl, and North Shore. In 2011 he joined the cast of FX's hit show Sons of Anarchy as the new Sheriff of Charming, Eli Roosevelt. Eli Roosevelt was the head of the San Joaquin County Sheriff Department, Charming-Morada Sub-Station. His official title is Lieutenant. Eli spent the last 15 years neutralizing gangs with a gang unit in Oakland, California before coming to Charming with his wife Rita. Roosevelt was well known for his history and success with neutralizing several gangs during his career as a police officer, a fact which Lincoln Potter liked and respected Roosevelt for. Roosevelt's behavior as a police officer seemed to resemble that of former Charming deputy David Hale. Much like Hale, Roosevelt was also a by-the-book police officer who seemed to despise SAMCRO, but would occasionally work with Jax Teller for a common goal. Both men also aligned themselves with another threat to the club, no matter what the cost (such as Roosevelt blackmailing Juice under orders from Lincoln, and Hale working with Ethan Zobelle, the head of L.O.A.N. ).